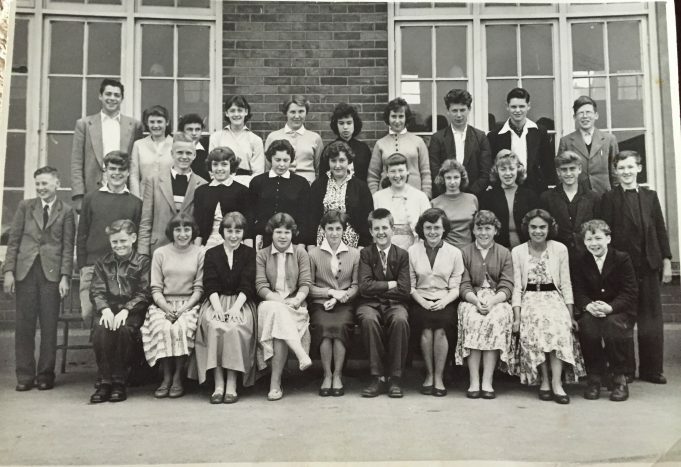 5th from right in the middle row (next to Sandra Malthouse) isn’t Beverley Sinclair but my mum, then Margaret Mason, cousin of Brenda Mason in the front row. Recognise all the girls and some of the boys. I was in this class but as a Christmas time leaver, along with a handful of others, was not in the photo. I left when I was 14, had my 15th birthday days later and started work in London beg of January. Barry Benton, Valerie Cullum, Joan Ellis, Valerie Carter, Sandra Cox, Irene Barnes, Gloria Allberry, Frank Hewitt, Kenny Herbert. Michael Hoare, John Summers, Colin Beck, Beryl Major, Janet Trives , Sandra Malthouse, Beverly Sinclair, Pamela Redknap, Jackie Pease, Billy Cook, Donald Gardner? OK, but he certainly looks like the Mick Nash I remember. Are they by any chance related? Guess not! That’s my aunt, Brenda Mason, third in from the right, front row. Brenda lived in Melba Gardens, as I did. She married George MacGowan, and after living in Tilbury for a number of years, they moved to the Braintree area. Sadly, Brenda died about twenty years ago. Not my year, I passed through St Chads five years previously, but fifth from the right, seated, must be Mick Nash of Rockin Devils fame. We worked together at TBM in the Engineering Purchasing Department In the late 60’s.